Learn About Dental Sealants - What they are and how they help. Most children who visit the dentist will have dental sealants put on their back teeth at a very early age. If you have ever inspected your molars and noticed a while filling in the grooves of the tooth, it is very likely this sort of material. If you are wondering whether dental sealants are right for your child, if you are considering getting dental sealants yourself, or you have never heard of them before and want to learn more, read on to find out all you need to know. A dental sealant is made of a special plastic material that is usually either white in colour or clear. It is molded to the tops of teeth which have deep grooves or pits as a means of protection. The idea is that the plastic will cover the pits in the tooth – which are also called fissures – so that sugars, acids, and bacteria cannot get into them and decay the tooth. Dental sealants act as a physical barrier between destructive bacteria and the vulnerable parts of teeth, preventing cavities and adding an extra level of protection. Plaque can get almost anywhere, so you want to take every advantage to make life difficult for those little guys! Who needs to have dental sealants? Just about the perfect time to get dental sealants! Generally dental sealants are applied as soon as a child’s permanent back teeth, the molars, grow in fully. This is so that the deep grooves and pits that are normally found on the chewing surface of the teeth are filled in before any decay sets in. Protecting molars from the very start greatly reduces the chances of getting cavities or worse dental issues later on. While sealants are generally applied during childhood, some adults may need to have them applied later in life if they never had the procedure done earlier or if pits develop in teeth where there were none previously. It is the exact same procedure regardless of the patient’s age, and the only difference is how much damage to the tooth has occurred before the sealant procedure takes place. Before a dental sealant can be applied to a tooth, the tooth is thoroughly cleaned by a dentist or dental assistant using polish and a rotating brush. The tooth is then rinsed with water and dried before an acidic solution is applied. This solution roughens up the surface at the microscopic level so that the sealant material grips onto the tooth securely. Next, after the solution has dried, the sealant is applied as a liquid directly on top of the fissures in the tooth. The sealant is then set with a special light or, if a two-part sealant has been used, it will set on its own without extra curing. Once the sealant has hardened, it is ready to go and can be bitten down on. Dental sealants are designed to last for years, often as long as the tooth lasts, unless damaged. If a dental sealant is damaged a replacement sealant can be placed on top of the same tooth. How do you take care of dental sealants? 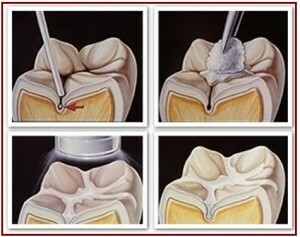 Once a dental sealant is applied and set on a tooth, it requires no additional or special treatment. Just be sure to continue brushing twice each day and flossing regularly. For additional protection and an extra brilliant smile, use a fluoridated, non-alcoholic mouthwash after brushing your teeth. What if my dental sealants don’t feel right? Because your top and bottom teeth usually fit together snugly, barring an alignment issue, any foreign substance between teeth can feel uncomfortable at first. This is normal and usually only takes a few days to get used to. If there seems to be a small oddity in the way that your dental sealant feels when you bite down, give it a week or two and it should go away on its own. Your dental sealants will be shaped to suit the nuances of your specific bite over the course of regular chewing and grinding of teeth. However, if your sealants are in any way painful or more than a bit uncomfortable, be sure to alert your dentist to this so that adjustments can be made. What can happen if you don’t have dental sealants? Notice how small the fissure is in the upper images? 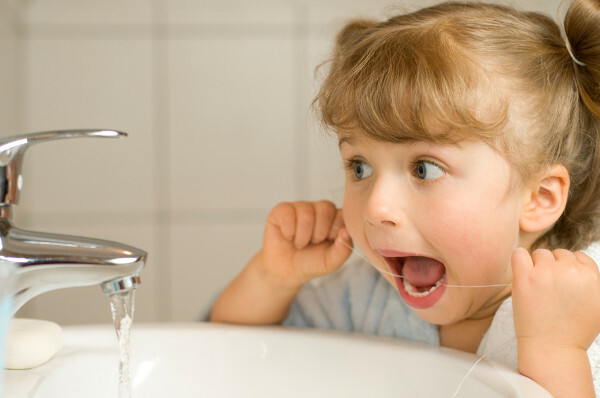 Sealants help to make sure that you never need to worry about bacteria getting stuck in there again. Teeth that have deep pits, such as molars, are especially susceptible to decay as bacteria can get into the tiny crevices and stay there. It is extremely hard to clean fissures in teeth with a toothbrush and floss. Once bacteria is stuck in the tooth’s pits it will generally stay there and decay the tooth rapidly, resulting in cavities. If cavities are left untreated, they can result in the loss of teeth or the need for intensive procedures such as root canals. It is always better to be preventative when it comes to your teeth rather than have to deal with a larger dental issue down the road. Should my child have dental sealants? When should they get them? It is best to have dental sealants applied as early as possible so that no bacteria is trapped inside teeth grooves and there has been absolutely no decay yet. This means that the best time to have sealants applied is around age six, when the first adult teeth come in. No one rule works for everyone, though, so to protect your child’s teeth it is recommended to have dental sealants applied to their molars when your dentist advises you to do so. Where can I have dental sealants applied? Any general dentist will be able to apply dental sealants, and you may have already had them applied and be unaware of it. If you aren’t sure, just ask! If you do not already have a family dentist, be sure to find a 123Dentist who provides sealants. This video has plenty of technical information, but also does a good job of explaining some of the technologies and techniques used to seal teeth.